There's no longer an inherent contradiction between "sustainable" and "glass box" - not with 21st-century technology and a holistic approach to sustainability that encompasses much more than the building's own environmental envelope. 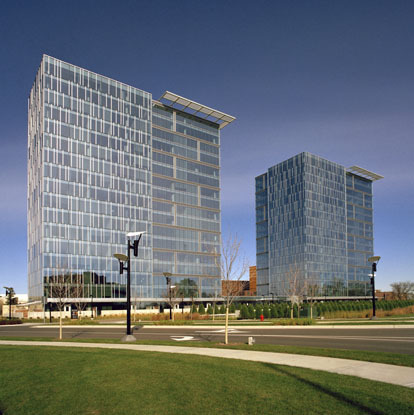 Reflections at Bloomington Central Station, completed in 2006, comprises a pair of 17-story glass residential towers linked by a low-rise entrance lobby. 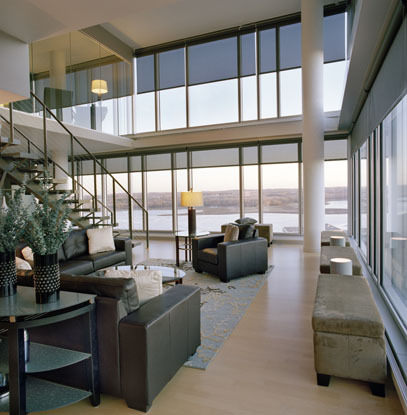 If sleek, transparent towers unencrusted with balconies or ornament seems like an unusual approach to high-rise condo design, so is the result: LEED certification, the first high-rise condo project in Minnesota to win the environmental honor. Elness Swenson Graham Architects of Minneapolis designed the project, in collaboration with architectsAlliance of Toronto. 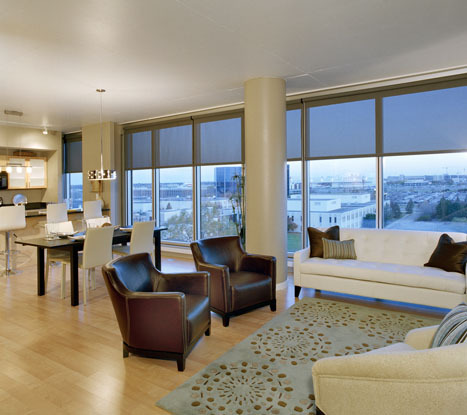 One vital key to Reflections' remarkable energy efficiency is its triple-glazed, inoperable floor-to-ceiling windows, which invite natural light into 97 percent of the interior spaces. This far exceeds LEED's 75 percent daylighting minimum. 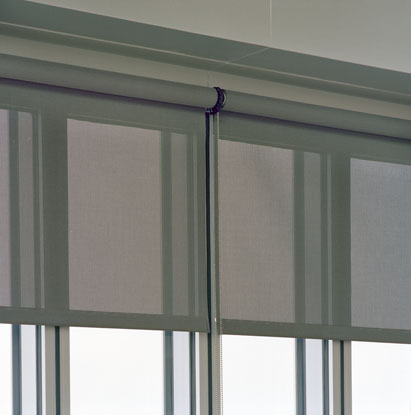 Hunter Douglas Roller Shades FR - motorized in the penthouse loft windows, manual elsewhere - deliver privacy and solar control. And it was these windows that essentially generated the project's form. The towers rise just south of eight-lane Interstate 494 and Minneapolis-St. Paul International Airport, which was planning expansion with a fourth runway at the same time McGough Development was planning its 54-acre mixed-use project next door. "So here we were proposing new housing, while the airport was out there buying existing houses that they were going to tear down and remove," says Mark Fabel, McGough's project manager. "The airport authority agreed to support our project if we didn't have balconies and operable windows." And what then? McGough admits, "We stepped back and said, how do we create residences where people don't feel like they're enclosed in an office building? 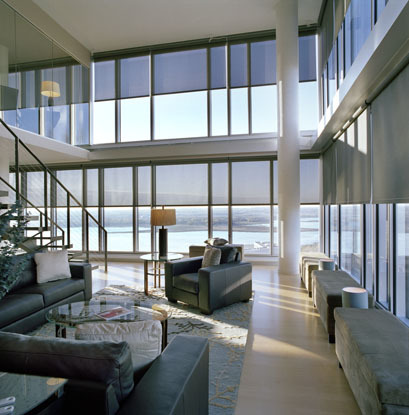 The answer was floor-to-ceiling windows that provide a real sense of connection to the outdoors." Fortunately, the project had a spectacular natural amenity on its southeast flank: the Minnesota Valley National Wildlife Refuge, a scenic 14,000-acre riparian corridor of marsh, grasslands and forest. With the big windows, this became a priceless asset. 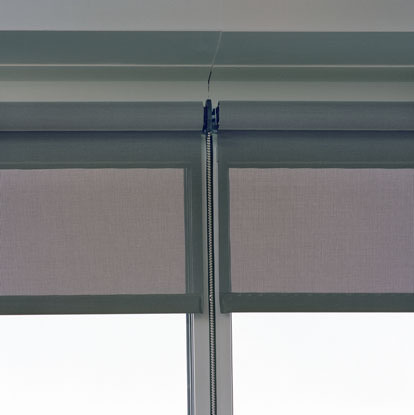 Besides handling excess solar heat and glare with the Hunter Douglas Contract Roller Shades, the only other issue was keeping the mechanical roar at bay. McGough and the architects huddled with acoustic engineers and devised a triple glazing system for the curtain wall, including a 4 1/4-inch air pocket between the double-glazed exterior skin and the interior glass. From inside, the wall reads as transparent. From outside, the blue-tinted curtain wall reflects the environment so effectively that the big boxes seamlessly elide into sky and clouds. Each tower appears as a pair of conjoined fraternal twins, with one-half wearing an inscrutable expression of confetti mullions, and the other a regular pattern. The visual merger of architecture and environment symbolizes something substantive. The approach to sustainability here goes deeper than energy efficiency and storm-water management. Although Bloomington Central Station hardly resembles the nostalgic neighborhoods of Craftsman Revival cottages typically associated with New Urbanism, it decidedly conforms to core New Urbanist philosophy. The entire residential, office and retail development, planned to be built over 10 to 15 years, is designed to be pleasantly walkable and centered around a Euro-style central plaza. The Hiawatha light rail line, which scoops up passengers 110 yards from the towers, offers effortless access to the Mall of America, the airport and downtown Minneapolis; an eventual expansion will add the University of Minnesota and St. Paul. Fabel says he doesn't know of any residents who've opted to go car-free, "but there are definitely people who are using the transit for 80 percent of their commuting behavior, to go downtown for work or entertainment." The payoff for the developer isn't as clear as the environmental benefits of the project. Fabel describes a post-occupancy meeting he had with about 75 of Reflections' residents. They all claimed to love living there, he says, and there had been sales from referrals. But when he asked how many people had bought in because it was a green project, only two or three hands went up. The others said their decisions were based on design, location, and access to transit. "The LEED certification wasn't critical for them, though it was one more positive that helped close the deal. I don't think we've reached the point yet where most people are willing to pay a premium for a green building." But a blue building that seems as intimately connected to the sky as to the urban fabric woven around it - clearly, that's another story.